The Polestar 1, which looks almost identical to Volvo’s S90-previewing Concept Coupe of 2013, is based on the platform used by the S90, V90 and XC90, but around half of the chassis parts are said to be unique and some of the bodywork is made of carbon fibre to save weight. Polestar hasn’t revealed full details of the technology underneath, but the rear axle features an electric motor at each wheel, producing a combined 216bhp and with a battery-only range of 96 miles (150km) when fully charged. That’s significantly further than any other plug-in hybrid, with performance and range extended using a 2.0-litre Volvo petrol engine at the front wheels, boosting output to 594bhp and offering four-wheel drive. It’s a similar layout to Volvo’s ‘Twin Engine’ plug-in hybrids, though those have a single motor at the rear axle and much shorter ranges and less power in EV mode. This isn’t a concept. 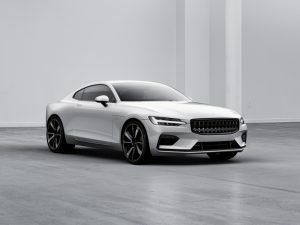 The Polestar 1 is already available to order, with production scheduled for mid-2019 at the company’s forthcoming factory in China, which opens next year. A fully electric compact-executive car – rivalling the Tesla Model 3 – will launch shortly afterwards, followed by an electric SUV. All Polestar vehicles will be sold online, offered on a two or three-year subscription with zero deposit, and customers will use their phone as a key. Monthly payments will include access to other Volvo and Polestar models when needed.